Our mission is to be in three cities – Mumbai, Bangalore and Chennai. Tomorrow, we are to going to Bangalore. Our investors are mainly small and medium companies. They want to increase their knowledge of India. That means no financial commitments to GIM. Already, more than 240 Japanese companies are stationed here. The name of Chennai is very famous in Japanese business circles. Tamil Nadu is very pro-active. The potential is high. I have heard from the Japanese companies here that they find the people and work environment here to be comfortable. The quality of labour is very important and the workforce here is hard-working. Any challenges or concerns they have spoken about? Of course, there are many challenges, especially for newcomers. When they try to start business, it is not so easy. Even now it takes time… too many bureaucratic processes. It is not the case of other countries, especially ASEAN countries. They are more aggressive in welcoming Japanese investments. The Indian government needs to improve on this front. 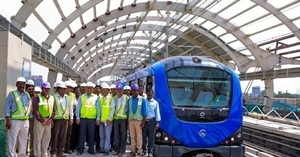 Japan has invested so much money in Chennai Metro Rail. Are you satisfied with the progress? It is a concern. But we recognise that in case of India, everything does not move smoothly. Of course, we are expecting quick movement. (He declined to elaborate on the issue). Japan’s Bank of Tokyo-Mitsubishi is signing an MoU with the TN government. How will it help? The bank is an intermediary stage. They have a wide range of customer base. They know the needs of each customer. Are there any plans to set up a Japanese bank here? Bank of Tokyo-Mitsubishi and Mizuho already have their branches here. Remaining is Sumitomo Mitsui Banking Corporation (SMBC). They are proposing to the Central Bank to set up shop here.